The company we know today as Kuhl originally was known as Alfwear and was founded in 1983. Alfwear was created by four co-founders – John “Alf” Engwall, Conrad Anker, Jay Boyle, and Kevin Boyle. Their own experiences in the world of skiing, rock climbing, and mountaineering led them to create products and gear that suited even the pickiest outdoorsman. Sadly, Engwall passed away shortly after the company was started, but Anker and the Boyle brothers carried on with Kuhl as we know it today. Kuhl is an outdoor apparel company that is well-known for working with contributors that aren’t just familiar with designing clothing, but those that actually live the adventurer lifestyle. The clothing that Kuhl carries is made by people that ski, bike, backpack, camp, and travel all over the world. With a tagline of “High-Performance Fabrics. Casual, Laid-Back Styles.”, you can tell that the brand combines performance with comfort. Outdoor enthusiasts will quickly find that while it’s fairly easy to find durable, warm, and comfortable long-sleeve tops, fleeces, and jackets, finding high-quality pants isn’t as simple. Issues arise with fabric that’s breathable, but too thin and weak, or fabric that’s super tough, but stiff and chafing. Another common problem with pants is that they lack a proper range of motion. 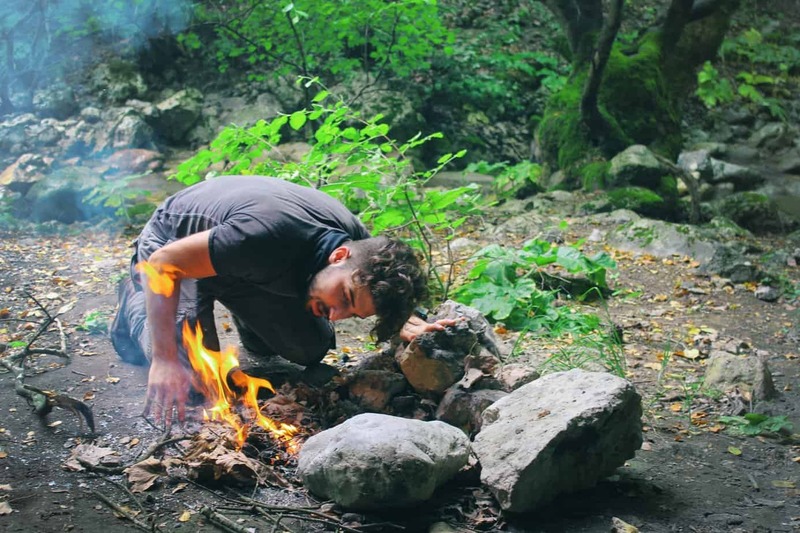 Nothing is as annoying as trying to maneuver around a campfire or get in and out of a canoe, just to have movement limited by your pants. 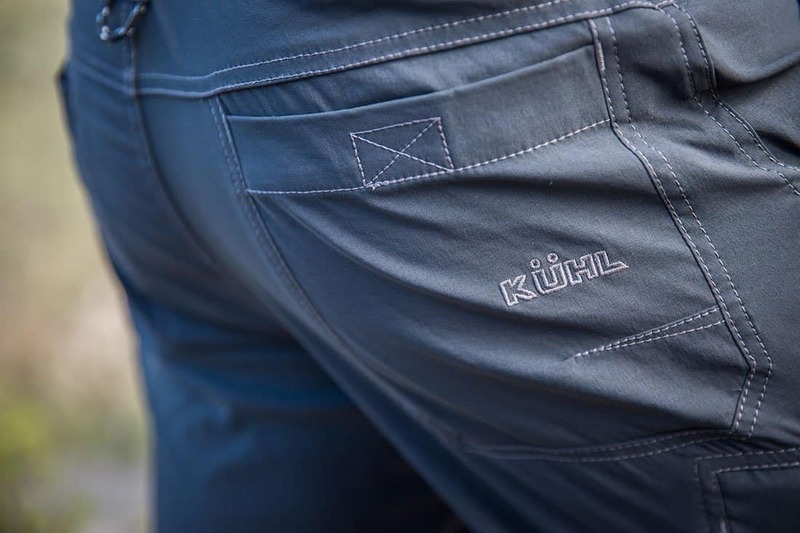 Kuhl was the original manufacturer of Articulated Pants – a style of premium pants designed specifically for the needs of outdoorsmen. 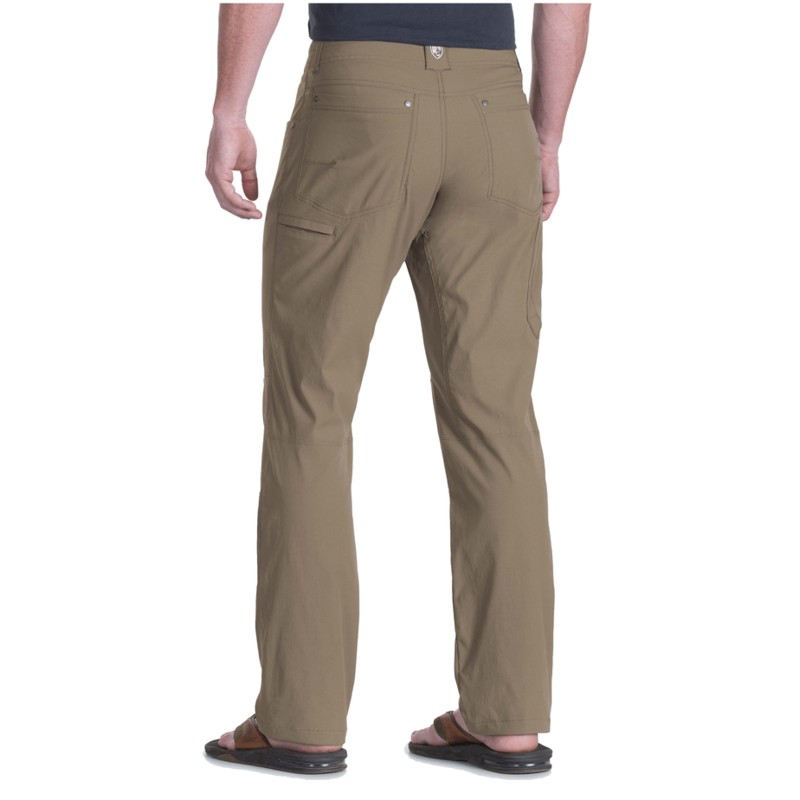 They offer a number of different hiking pants for this purpose, with their Renegade pant being a highly praised choice. 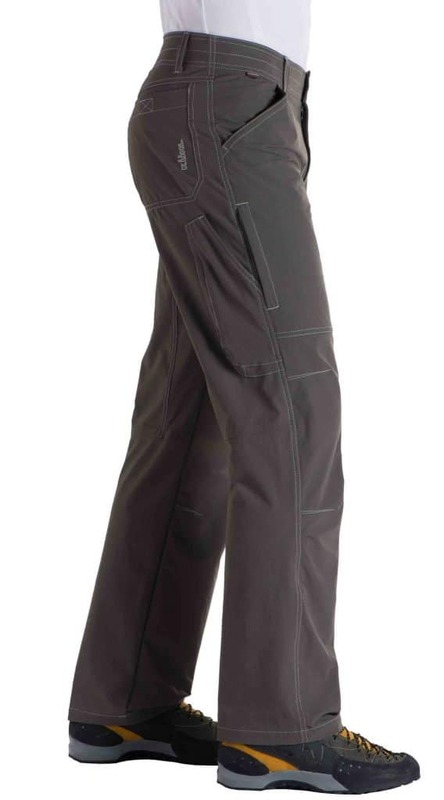 When Kuhl designed the Renegade Pant they went against was most brands considered the conventional way of designing outdoor pants. The typical stitching and construction of standard pants really didn’t allow for a wide range of movement. The Renegade pants are created with an articulated knee and a gusseted crotch to prevent tightness or bunching in these areas while hiking. Kuhl also made special attention to what materials they chose for the Renegade. The Renegade Pants are made of DuraLux 95% Nylon, along with 5% Spandex treated with a DWR coating. This gives these pants a cotton-like softshell feel to them. DuraLux is superior to other material in that it’s quite tough and highly resistant to abrasions or tears – something that is very important for anyone that ventures through rough country. The DWR treatment ensures that you’ll have adequate water-resistance than typical nylon and quick drying if the pants do become wet. Kuhl also includes a UPF 50 sun protection rating to keep you protected in the rain just as well as the sun. These pants have Kuhl’s Klassic Fit, which is best described as a relaxed fit through the thighs. A peached waistband helps wick sweat and moisture, while still being quite comfortable to wear for long periods of time. Some other features of the Renegade Pant include a total of eight pockets, including zippered side pockets to prevent valuable objects from accidentally falling. The Renegade Pant has been updated over the years, to offer an improved fit. Customers have found that these updates have made the Renegade better, with the new models being just as impressive as the original. Additionally, Kuhl also expanded the Renegade series to the Renegade Jean and the Renegade Cargo Convertible. More information on these two options will be included below. The vast majority of retailer websites have the Renegade Pant with a 4.5 or higher star rating. These are a cult classic of the Kuhl brand and still widely popular among those that aren’t just loyal to the brand. There are three great advantages to these pants compared to other brands. Save for extreme sports, the Renegade pants will keep you protected and comfortable for nearly any outdoor sport – hiking, backpacking, weekend camping trips, canoeing, hunting, fishing, and more. The gusseted crotch and articulated knee stitching offer a non-restricting fit but still moves with the body rather than loose material getting in the way. If you spend a lot of time outside for work, these also will work very well. Many find they are perfect for casual wear in place of regular khakis. Although a lot of outdoor apparel companies are improving in this area, it can still be difficult to find a good size and color selection for pants that are designed for hiking. 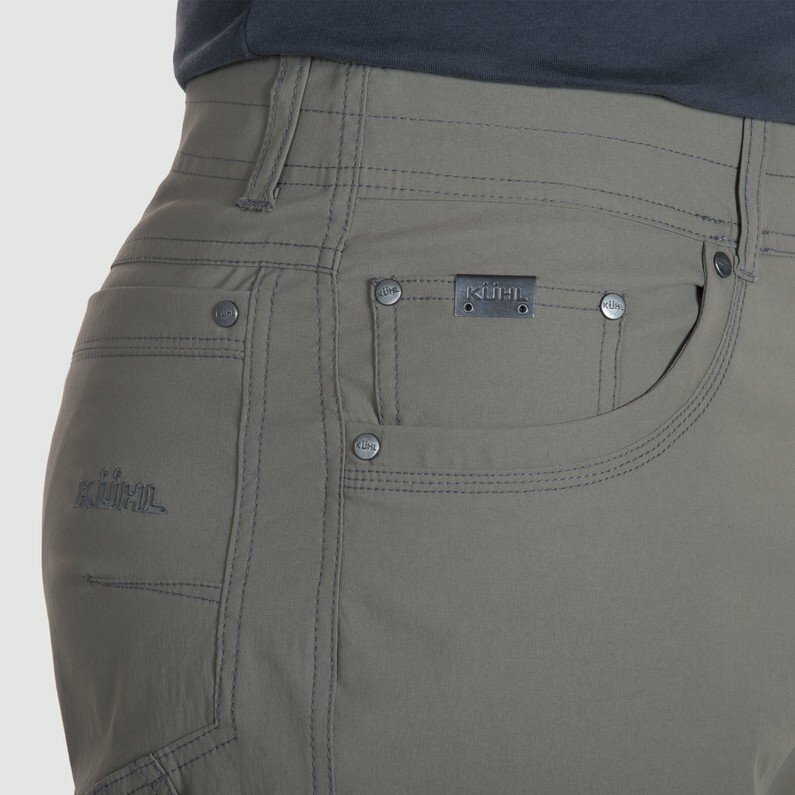 The Kuhl Renegade not only comes with multiple color choices, but they also have a wide size selection for waist and inseam. There are 7 colors total – Dark Forest, Koal, Birch, Khaki, Brushed Nickel, Buckskin Khaki, and Pewter. For waist sizes, you have standard 28 up to 42. Inseams come in 28 to 36. Certain waist sizes are only available with certain inseams. For example, a 28 waist only comes in 28, 30 or 32 inseam, but most waist sizes are offered in all inseams. Despite having such a light feeling, the Renegade pants are super durable and really last through a lot of use. How much wear you’ll get from these pants obviously depends on the activity you’re doing and how often you wear them, but you can expect them to perform for as long or longer than other outdoor pants. As far as pricing goes, the Renegade Pant retails for $85 even, regardless of sizing or color choice. This is quite competitively priced considering these perform like a high-end pant. The cost of these is absolutely worth how much value they offer in longevity and comfort. There aren’t any real disadvantages to the Renegade Pant in terms of quality. Poor reviews citing manufacturing issues are very rarely seen and overall the vast majority of men are very happy with these pants. However, Kuhl did change up the design of the original Renegade a bit. While most have found the improved Klassic Fit to be just as great, some weren’t happy the new fit. This could be an issue for some. 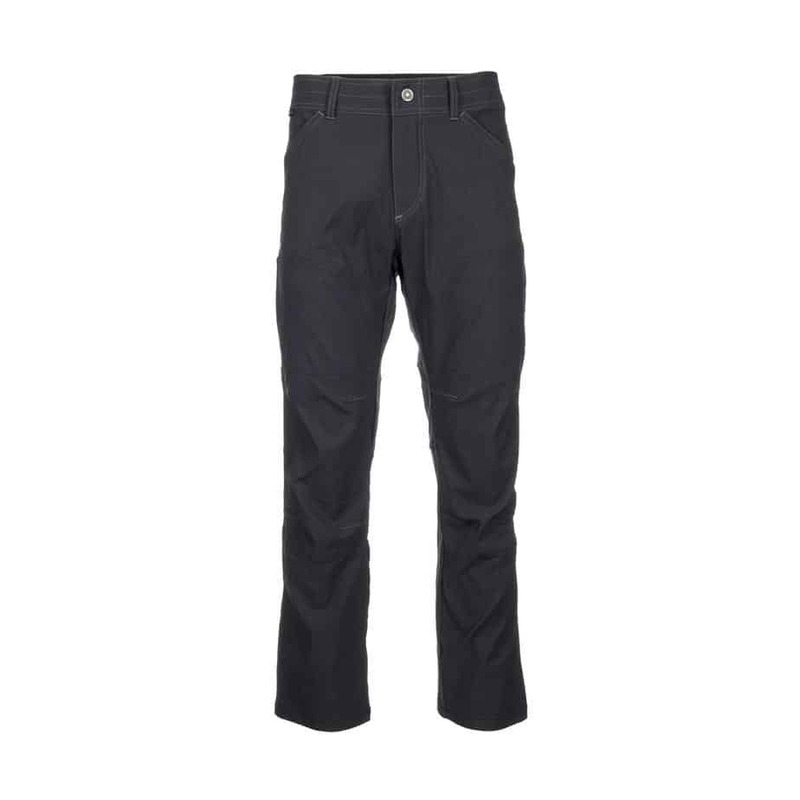 The Renegade Pant has Kuhl’s Klassic Fit, which is best described as a relaxed straight leg. There isn’t a bunch of excess material as this would only inhibit movement. 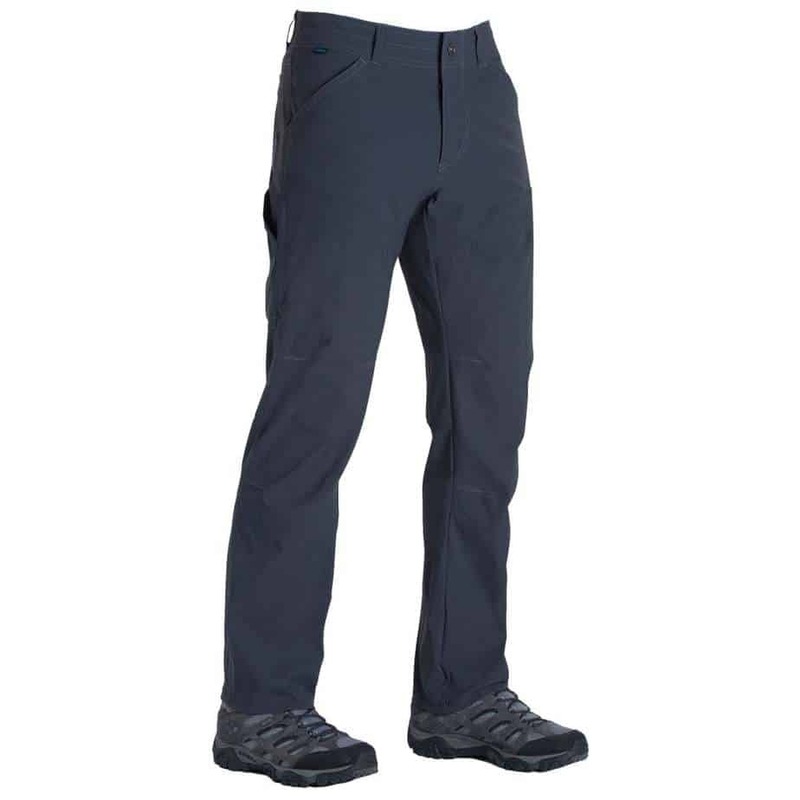 Considering that these pants are designed for active individuals in outdoor environments and many rely on them for hiking/backpacking, it was important for Kuhl to keep these pants somewhat fitted. The end result is a tapered leg. The tapered leg isn’t extreme by any means, but some do find it to be an annoyance. Therefore, if you tend to stay away from tapered legs of any type, you might want to try on these pants before purchasing. Overall, the Kuhl Renegade Pant is a superb pair of pants for any man that wants something for daily wear in the outdoors. It’s particularly great for warm weather wear, thanks to its lightness and breathability, but layer long underwear under it and you can easily wear them in fall or very mild winter conditions. These pants are tough, can take a lot of abuse, and come in a better range of colors and size that typical outdoor pants. You will definitely want to give these a try.